It's been a busy Brexit week - what has happened now? Theresa May has written to the President of the EU Council Donald Tusk asking for an extension until June 30 so she can try to get her divorce deal - allowing the UK to depart in an orderly way - passed by parliament. It has long been expected the UK would need to seek a short extension to the March 29 deadline. The British system means that even if the deal was agreed now there would not be enough time to legislate for it. But there was also speculation Mrs May could seek a longer extension from Europe in the event that her deal is not ratified by MPs in Westminster. It is believed this idea did not go down well with members of her cabinet who fear a long extension could risk Brexit not happening at all. Mrs May was yesterday accused of pandering to the Tory hardliners in her party in a bid to keep her party intact and her government in power. Wait, I thought she couldn't have another vote? Well... technically she faces a bit of an uphill struggle to have a third "meaningful vote" on her deal. 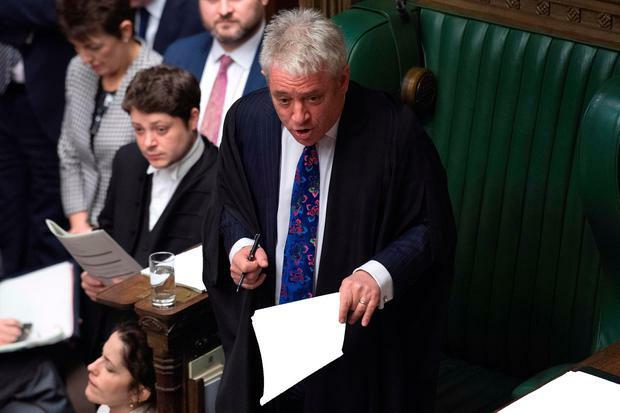 In a ruling earlier this week the Speaker of the House of Commons, John Bercow, said Mrs May could not bring the deal back after it has been twice rejected unless it was substantially changed. His ruling was based on parliamentary procedures dating back to 1604. It has caused another headache for her but Mrs May does plan to bring the deal back. But after two defeats, will it even pass? Good question - it does seem unlikely and there are two schools of thought on that. The first, which is Downing Street's gamble, is that faced with the threat of a no deal, MPs will finally come behind the agreement. But there are concerns that with a short extension the only option on the table, hardline Brexiteers will be more likely to hold out for a no deal. How does Theresa May intend to pass the deal on a third roll of the dice? Since last weekend there had been serious efforts by senior ministers to convince the Democratic Unionist Party (DUP) to support her deal. The DUP's 10 MPs underpin the current government in a confidence and supply deal. But due to their fears that the deal - and especially the Irish backstop - will result in a regulatory border in the Irish Sea between Northern Ireland and the rest of the UK they have yet to vote in favour. It is expected that Mrs May will try to offer some domestic legislation tweaks or other assurances that Northern Ireland will not be treated differently to the rest of the UK after Brexit. Talks with the DUP had cooled somewhat while Downing Street tried to deal with the problem caused by Mr Bercow, but they will likely ramp up again now everything appears to hinge on getting the deal passed. Some rebel Labour MPs will also need to vote for the deal as a core of Eurosceptics in the party will never vote for the deal. What has Mrs May said? Last night, in a live address to the nation from Downing Street, Mrs May said she is not prepared to delay Brexit beyond June. She said MPs have failed to make a decision on how the UK should leave the EU almost three years after people voted for it. She said MPs are now facing a choice between her deal, no deal or possibly no Brexit. She said the public were tired of political games and infighting and so was she. Mr Tusk has said he believes a short extension may be possible if the House of Commons backs the Brexit divorce deal next week. EU leaders - including Taoiseach Leo Varadkar - will hear from Mrs May in Brussels today before she leaves to allow them debate an extension. Surely the EU has to give her an extension or else we're looking at a crash out? The Brexit brinksmanship is well under way. The EU hs said that without a ratified deal it will not grant an extension. However, the bloc has also insisted that it does not want a no deal which would be bad for everyone. The Taoiseach said he believes a no deal is unlikely and said it is time for the UK government to be cut "some slack". Ireland supports an extension but some in Europe feel it just extends the turmoil. There is a "growing frustration" in Europe at the fact Brexit has taken up so much time and energy with no solution in sight. Today's meeting will be interesting to say the least.